All the surfaces of the teeth are hand scaled inside, outside, front and back. The teeth are then polished with prophy paste. The dogs can be left with me during the cleaning process. Only use pet products, never human toothpaste. Human toothpastes contain fluoride and foaming agents that may cause stomach upset in pets, since they swallow the paste rather than spit it out. Try to get your pets used to having their mouth area and muzzle handled. Start by gently handling the muzzle area on a daily basis. Be sure to provide lots of praise. As soon as your pet starts to show its dislike, stop and try again later. For best results with puppies, choose “quiet times” only, for handling the mouth area. Each session should end on a positive note. Do not use industry so called 'pet toothpastes' (ex. beef, chicken, cheese, or anything flavored), as they contain chemicals, dyes, sugars and ingredients that actually irritate your pet's gums. We suggest using the Oxyfresh pet gel as a general conditioning and as a toothpaste. Use a toothbrush provided by your vet or by a K9 oral hygiene specialist with soft to medium bristles, or a child's toothbrush with a small head. Always wet the bristles of the brush before placing it in your pet's mouth. Gradually build up the pressure and amount of time applied to each tooth. Be sure to eventually build up to brushing the inside of the teeth, not only the outside (cheek-side) surface. Remember to continually give praise. Brushing your pet's teeth will be a challenge so just remember that you're doing what's best for your pet, be consistent with your care, and you both will benefit. 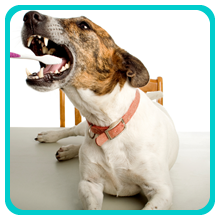 If you think your dog is likely to bite you, don't brush his or her teeth. If his teeth already have calculus, don’t start brushing as it won’t help remove the calculus and it may irritate already sore gums even more, causing them to bleed.